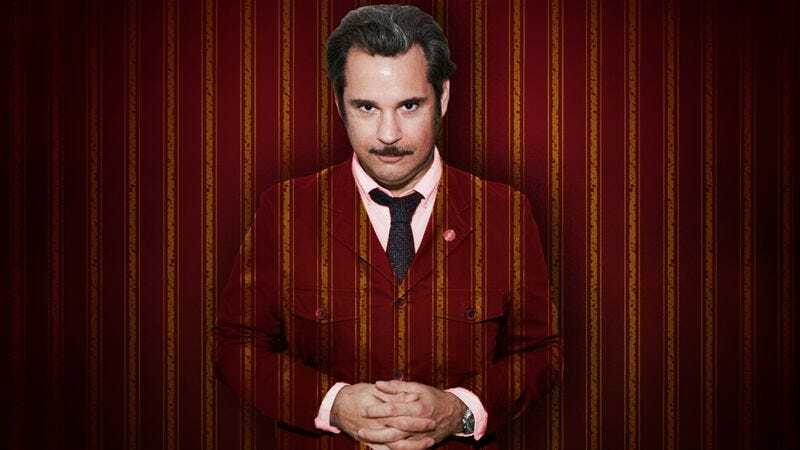 A longtime comedian whose current gig, No, You Shut Up!, involves debating politics with a hot dog puppet, Paul F. Tompkins has appeared on shows like Mr. Show With Bob And David, Best Week Ever, and Comedy Bang! Bang! When he’s not on the small screen or being interviewed, in this case, before his performance on the F-Comedy stage at the Riot LA comedy festival, he’s the host of his own improv-centric podcast, Spontaneanation, which is part of the Earwolf network. Paul F. Tompkins: What questions have you been asked before? That’s my question. The A.V. Club: Why that? PFT: Because I feel like I answer the same questions over and over and over again. PFT: There’s that. There’s “How do you feel about the term alternative comedy?” A lot of podcasting questions. How has podcasting changed things? A lot of people ask me if I feel I should be more famous. AVC: That’s a little subjective. PFT: It’s a sad question, really. AVC: If you said yes, that would be pretty gross. PFT: Yeah. Absolutely! It’s just such a weird thing. A lot of people ask me about clothes. A lot of questions about clothes. PFT: I think a bison. That would look really cool, and there’s something about them that I feel is really noble and really wise. And I feel like we would have a good understanding of each other. I think he would be okay with me riding him, and I think I would be okay with him not being comfortable at all. AVC: You’d be okay with a slow ride? PFT: Yeah. I’m not in a rush. AVC: That’s what Rob Huebel said. PFT: I think Jaws is one of those movies that, if it is on, I will watch it until it’s finished. That’s if I’m flipping around channels, although it’s not my favorite—it’s probably my second favorite movie. My favorite movie is Lawrence Of Arabia. But that’s a long, long movie. So although I’ve seen it several times, it’s not as fun as Jaws. Probably the movie I’ve seen second most often is that weird HBO movie about [David] Letterman and [Jay] Leno, The Late Shift. There’s something that’s very compellingly watchable for me about that movie. It’s so weird. It’s so weird. PFT: Up until I think eighth grade—when I found out in front of a roomful of people—I believed that England and Great Britain were two entirely different places. Like I didn’t know that England was a part of Great Britain. I thought they were completely separate in every way. AVC: How did you envision it? Did you think one was in central Europe, or what? PFT: That’s a good question. I don’t know. It wasn’t until probably a couple years ago when I started to force myself to find out the answers to questions about things I didn’t know. You know, it’s that fear of being found ignorant and so you just nod along with what someone says. I think that I just took it for granted that they were two different places. I never questioned it at all. 5. What’s the most interesting thing you’ve ever heard or read about yourself that isn’t true? PFT: Someone thought that I dropped out of Harvard. I am a college dropout, but I dropped out of Temple University in Philadelphia. And I saw on some message board or something that someone thought that I had dropped out of Harvard, which—I don’t know. Is that a better brag, in terms of being a dropout? Because I guess you got into Harvard in the first place? So I suppose I could’ve stayed with Harvard but I elected to drop out. PFT: Yeah. I’m too good for Harvard. PFT: I’m not a super adventurous eater and I try to make myself try things. When I was younger I was strictly meat-and-potatoes and I just wouldn’t try things. As I have gotten older, I’m much more adventurous but still not like whoever that dude is on whatever show it is who just goes around and eats bugs everywhere. Probably the first thing that comes to mind is alligator, which I enjoyed very much. 7. What was the first concert you ever went to? PFT: I think it was Squeeze at the… It was a college show. It was a friend’s college. And that was the first time I ever saw a band in concert. AVC: When was this? Like around “Tempted”? PFT: No, after that. How old do you think I am? This was around when they had an album called… I don’t remember. The single from that album was “Hourglass.” And so it was kind of after the big heyday, although they’ve always been kind of a niche band, with that amazing greatest hits collection. They were never an arena band, but that was like late ’80s, early ’90s, something like that? PFT: My first thought is that I got to do this Australian talk show that was shot in Los Angeles for an Australian audience, called Rove LA. It was hosted by this guy Rove McManus. And the format was perfect. It was extremely conversational, there were three guests, everyone is out there the whole time, so everyone’s interacting and everything. So it was me, and the other two guests were Tim Gunn and Hugh Jackman. And it was one of the most enjoyable experiences, like top five experiences I’ve ever had in show business. AVC: Those two seem like the most likable guys. PFT: They were tremendous. They were a delight to listen to and to talk with, and everybody got along great. That was a tremendous experience. AVC: Did you leave with Tim Gunn’s phone number? PFT: I did not. But a very touching thing was that he knew who I was. I went to meet him and he said my name before I could introduce myself. And he complimented me on my outfit. I don’t know what more you could ask for. PFT: In my late teens, early 20s, when I started stand-up and I was living downtown for the first time, I was deep into my blues and Bukowski phase. And, you know, that’s when that’s appropriate. And I grew out of it. AVC: That’s when no one understands that stuff but you, man. PFT: Yeah. Exactly. Exactly. White man’s blues. PFT: I famously stole tons of VHS tapes from a video store I worked in. It was detailed in my special, Laboring Under Delusions. I worked at Tower Video and stole a bunch of videotapes from them, and then got caught and had to return the videotapes. It was a mortifying experience. AVC: Did you keep your job? AVC: And you still had to return them? PFT: I still had to return them. AVC: What happened when you returned them? PFT: I walked them in inside a bag and dropped them off and then left. AVC: That sounds very humbling. PFT: It was a silent transaction. PFT: Tom Cruise. I did a teeny-tiny part in the movie Magnolia that ended up just being my voice and you can still hear my voice, but I sat next to him and did the table read for that movie and it was a surreal experience. AVC: Did they seat you there or did you seat yourself? PFT: I was the first to arrive, sat down by myself; he was the last to arrive, sat down next to me. And it was disconcerting. Also chronicled in my special, Laboring Under Delusions. Bonus question from Deon Cole: What turns you on? PFT: Ooh la-la. Now, are we talking in the James Lipton sense? It doesn’t have to be purely sexual? AVC: That’s up to you. It can be anything. PFT: Conversation. I like being around people who are good conversationalists. When there’s a give and take, and you are heightening an idea, exploring it together, that is my favorite thing in the world. I love a small dinner party—let’s say six people, max, where everybody’s having the same conversation. That’s my favorite thing in the world. AVC: What are you afraid of? PFT: That’s not for me to answer. I’ve already answered all the questions.